Tuesday, 29 January 2019, 3:18p.m. Poi E hit the number one charts in 1984 and is still sung by many today — however this Taupo neighbour is sick of listening to the hit song every morning. 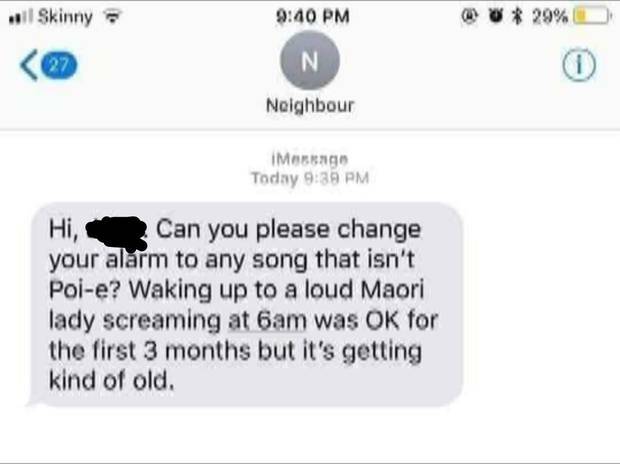 A Kiwi has taken to Reddit to share a photo of a text message received from a "friend's friend" yesterday, revealing how their neighbour has had enough of waking up to the Patea Māori Club's song every morning for the past three months. "Hi, [name censored]. Can you please change your alarm to any song that isn't Poi E?" the text began. "Waking up yo a loud Maori lady screaming at 6am was OK for the first 3 months but it's getting kind of old." The Reddit post has received lots of comments, with one person agreeing with the neighbour. "I like Poi E but hearing it at 0600 every morning for three months I would get sick of it as well," a person commented. One person wrote: "I think the takeaway here was she enjoyed it for the first 3 months. Next track on the CD?" Others suggested new alarms to try out, with some requests being quite bizarre. "Could go for movie soundtrack ... COOK YOUR OWN F**** EGGS JAKE HEKE," a person suggested. Another proposed a childhood classic saying: "What's the Time Mr Wolf would be great." "Maybe try Jono and Ben's countdown... see if they notice? ", a person asked. One person claimed that the Sponge Bob Square Pants theme song is the best alarm. "You can never get angry at Sponge Bob," they wrote. Other bangers mentioned were Robin Williams Good Morning Vietnam ft. Louis Armstrong, So What by Metallica and Guillotine by Death Grips.